The Remodeling Project involved the redesigning of this 40 year old Kitchen within the existing walls. 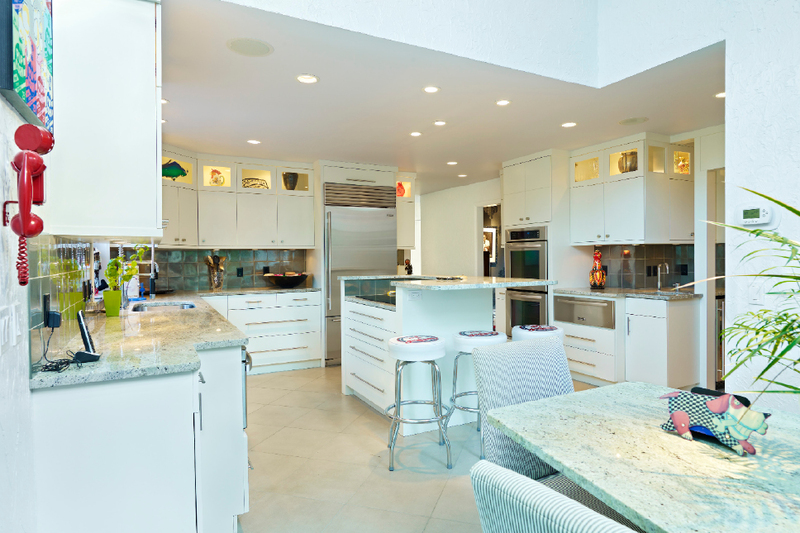 The redesign involved all contiguous areas including the existing island, the ill placed appliances, a two story Breakfast Room surrounded in glass and with adding more work space. The new concept needed to allow for larger traffic paths along with more workable counter space. A Wine Tasting Center, more cabinetry storage and built-in pantry units needed to be created along with relocation of the appliances. The existing irregular shaped Kitchen required to be redesigned in a manner which would allow a more spacious traffic pattern and be entertainment friendly along with meeting the family’s needs and additional storage. The challenge was to create this within a moderately small space which needed to allow passage to the Foyer, Dining Room, Rear Hallway, Powder Room, Garage and Rear Yard Patio. The Homeowners desired to incorporate new exciting spaces with lighting and cabinetry to take your breath away. The existing Kitchen was beset with cumbersome traffic patterns, but to create an existing and more spacious area, the design had to expand into less used areas, the Rear Hall closet and the Laundry Room. The two story Breakfast Room along with the Kitchen had to have its lighting completely redesigned to properly light the areas functionally and decoratively.